Motorola Omnii XT15f - Wi-Fi (80211a/b/g/n), 1D Laser Scanner (SE965 Scan Engine), Windows CE 60, Gun Grip, 34 key Numeric Keypad, 5300 mAh Battery, Arctic Freezer. Interface Cables And Charging Cradle Sold Separately. 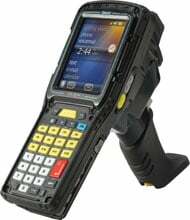 The Motorola OE431120D00E1122 is also known as MOT-OE431120D00E1122	.